Dine over two levels in contemporary surrounds while taking in magnificent views, at Boiler House Café on Great Western Highway at Medlow Bath. 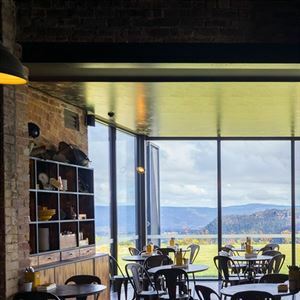 A sleek industrial fit out of polished concrete and exposed brick sets a relaxed vibe, while a floor to ceiling glass frontage allows guests to soak up the undulating landscape of Megalong Valley. 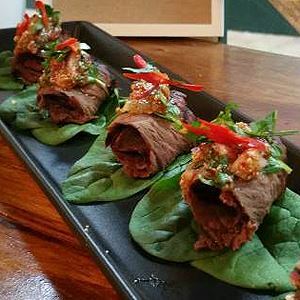 The café’s all-day dining menu features traditional pizzas, pastas and burgers, as well as Mod Oz fare showcasing regional produce from the Blue Mountains. Opt for entrees like grilled octopus with potato, lemon, tomatoes, olives, capers and parsley, before moving onto mains such as potato gnocchi with butternut pumpkin, spinach, almonds, radicchio and sage. Pizza lovers can pick up a slice of pesce with passata, mozzarella, prawns, onion and chilli.